Windguru mobile version is optimized for touchscreen devices - smartphones or tablets. 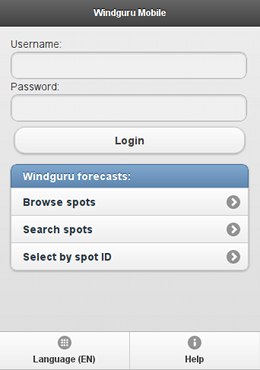 The purpose of this site is to get easily to your Windguru forecast using the touch screen. Windguru Mobile should work with most modern mobile browsers but please still consider it beta version only. Some bugs can appear, please excuse possible troubles. Windguru Mobile is built using jQuery Mobile framework. Functionality in various mobile browsers depend on capabilities of the browser and its support by jQuery Mobile. The jQuery Mobile framework is still under developement and only in beta stage yet, that's one of the reasons why you can experience problems in the navigation. If you were used to browse the Windguru WAP2 version, you should be familiar with using Windguru Mobile too, it's very similiar but offers more comfort. Same as on WAP2 you can access anonymously or login with your username to see your favourites and to get your PRO forecasts if you have PRO subscription.